140 cm x 100 cm. Initiated by Petruk, the Amarta Kingdom civil cervants, created ‘Nini Thowong’ puppet, decorated with rice stalks on her head. They sang sacred mantras while playing the puppet. 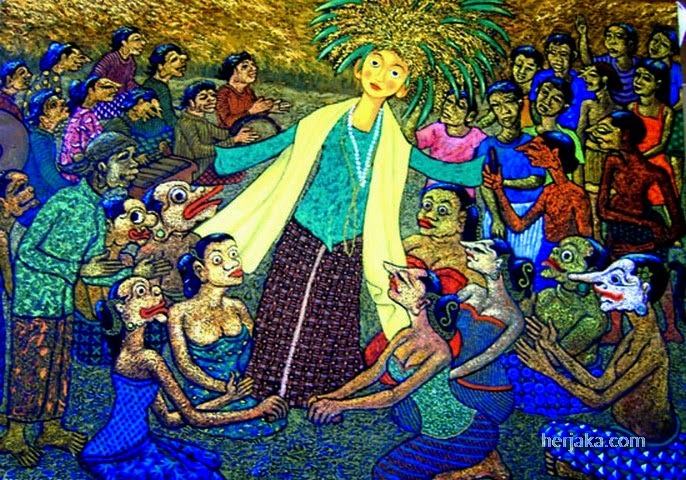 They asked Mbok Rara Sri or Dewi Padi, the symbol of prosperity, to come to them. If the Nini Thowong play is successful, it is means that Mbok Rara Sri will come to them. They hoped that prosperity would come to them soon. Their patience and loyality in waiting for prosperity is expressed in the unfinished song. “Bagea-bagea Mbok Rara lagi teka, bagea-bagea Mbok Rara lagi teka, bagea-bagea…” (Welcome, welcome, Mbok Rara is coming, welcome, welcome Mbok Rara is coming, welcome, welcome…).